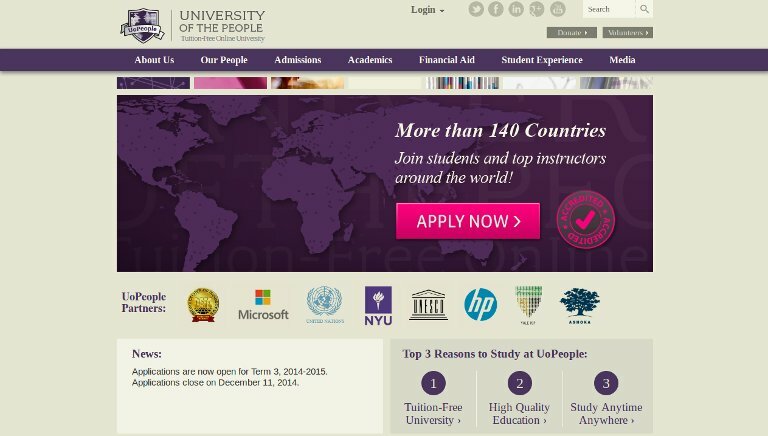 University of the People (UoPeople) is the world’s first non-profit, tuition-free, accredited online university dedicated to opening the gates to higher education for all individuals otherwise constrained. The University embraces the worldwide presence of the Internet and dropping technology costs to bring tuition-free undergraduate degree programs to qualified high school graduates around the world. UoPeople offers Associates and Bachelors degree programs in Business Administration and Computer Science. The University believes that access to higher education is a key ingredient in the promotion of peace and global economic development. It views higher education as a basic right, and believes that it can both transform the lives of individuals and be an important force for societal change. The mission of University of the People is to offer affordable, quality, online, degree-granting educational programs to any qualified student. Their goals: to provide the opportunity for higher education to students from diverse backgrounds through: utilizing the internet to provide distance education, offering programs at minimal costs, providing a wide range of financial aid options, and finally promoting the program in underserved regions of the world.